We're told that we should look at Giza in overall context. Overall context meaning that we should take into account not only the great pyramids, but also the mastaba fields and surrounding structures, we should view the entire development as an overall project carried out by a bronze age society. A necropolis. We understand that the great pyramid itself was surveyed and laid out to a very high degree of accuracy even by today's standards. No need to go into detail, but keep it in mind. Now let's take a look at the surrounding layout and structures in another context. The context of planning and surveying. Keeping in mind that the builders or building culture is fully capable of an astonishing level of competence. The mastaba fields are laid out in a neat and regular fashion, rather like city blocks, effectively avenues intersected by streets. However when a modern survey is carried out or air photos are taken we see a level of survey in the surrounding structures that no way matches the competence of the pyramid itself. Something that is not easily observable at ground level. In fact it demonstrates cumulative error resulting in angular deviation in the avenues and streets. All of which is perfectly understandable for a bronze age society using very simple surveying techniques. Going back to the second paragraph. Pyramid surveying accuracy. We now have a contextual mis-match. 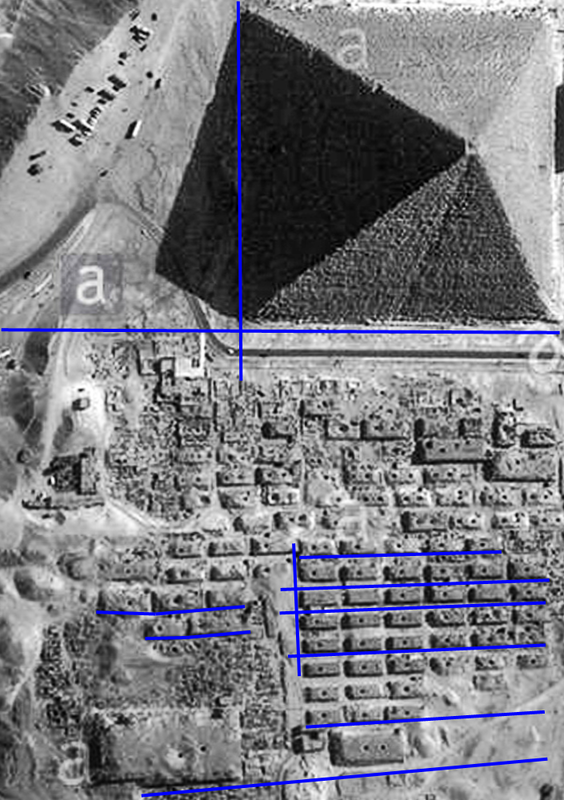 The mastaba fields in terms of a 'survey and layout context' in no way even begin to match the accuracy of pyramid itself. How could one culture have declined so much in their competence and ability to survey and lay out a site? How could these structures, pyramid and mastaba fields be in any way contextually, (architecturally or technologically) related? A gargantuan contextual mismatch which needs to be resolved. So what does match the great pyramids from a planning and surveying context? A fully quantifiable context that can easily be observed and measured today. The causeways the Sphinx and the Sphinx temples. Everything else is out of context. Edited 1 time(s). Last edit at 17-Dec-16 13:01 by Jon Ellison.